I am familiar with the structure and function of ATP synthase, but one small detail doesn't seem to make sense. It also happens to be a detail that seems very hard to express. Depending on the organism, there can be from 10 to 14 c-subunits in the c-ring of ATP synthase. For practicality/consistency's sake, let's assume 10. Every c-subunit is protonated (from the cytoplasmic side of the mitochondrion) and rotated almost 360 degrees within the lipid membrane before it is ultimately deprotonated, which releases a proton into the matrix. Thus, since the c-ring is 10 subunits big (in this case), 10 protons are being introduced to the matrix every 360 degree turn, which mean that 1 proton = a 36 degree turn. These protons allow for the gamma-subunit to be turned at the inside of the hexamer (of 3 alpha-subunits and 3 catalytic beta-subunits) found below the rotor. The b-subunits are thus located 120 degrees apart. Every 120 degrees precisely, that beta-subunit changes shape, dictated by the rotation of the gamma-subunit, and enters one of the three states that ultimately catalyze one ATP from ADP and inorganic phosphate (since only one of the three states actually forms ATP). Since the gamma-subunit catalyses the formation of 1 ATP every 120 degrees, a full 360 degree rotation would yield 3 ATPs. This is where things go awry in my mind. Within 360 degrees, 10 protons and 3 ATPs are made. Thus, that makes (10/3) protons per ATP, or 3.33 protons/ATP. When the gamma-subunit receives a proton, it rotates 36 degrees, but ATP formation only happens at precisely 120 degrees, and the only common interval between 36 and 120 is 360 (when 3 as opposed to 1 ATPs are made)! EDIT: The gamma-subunit must rotate in exactly 120 degree increments, because we observe it do so, as shown here. More detailed analysis in the presence of lower concentrations of ATP revealed that the γ subunit rotates in 120-degree increments, with each step corresponding to the hydrolysis of a single ATP molecule. Logically, this shouldn't happen though, since the closest increments of 36 to 120 degrees are 108 and 144. To summarize: How can 3.33 protons ultimately synthesize one, and only one ATP, knowing that a literal third of a proton doesn't exist (excluding quarks) and that increments of 36 degrees can never add up to exactly 120 degrees? “A Proton Gradient Powers the Synthesis of ATP - Biochemistry - NCBI Bookshelf”, n.d. http://www.ncbi.nlm.nih.gov/books/NBK22388/. I might be taking a bit of a simplistic view on this, but I'm not sure what the confusion is. The ring of 10 c subunits constitute a motor which uses a proton gradient to drive the rotation of the FoFc synthase. (image reference is a nice lecture on ATP synthase). The motor of c subunits has a 10 fold symmetry. Each subunit releases a proton as it drives a 36 degree movement of the gamma subunit shaft. The sixfold symmetry of the ATP FoF1 synthease is completely separate from this, and every 360 degree rotation, three ATPs are generated. 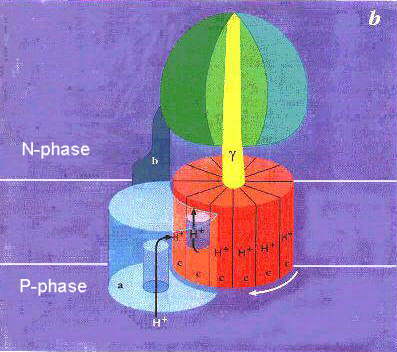 As long as the c motor keeps spinning more ATP is created. This question is similar to asking why the gear ratios of a bicycle or a car are 3:2 or 5:3. The symmetry of the synthase and the c subunit are independent except that the torque generated by the c subunit motor needs to be enough to drive the ATP synthase. If the proton gradient were stronger it could well be 7 protons per full rotation and not 10. Think of the two as gears and you might get the picture? In a normal chemical reaction you have to have integer numbers. 3 H+ react with 1 ADP and so on. The beauty of this system is that the electrochemical energy of the proton gradient is transferred physically not chemically to the ADP+P to form ATP. This is why you can break the integer rule that dominates most of biochemistry. The flow of H+ deforms the rotor proteins, they later transfer this energy to their substrates, and fuse ADP and phosphate generating the higher energy ATP compound. Not the answer you're looking for? Browse other questions tagged proteins cellular-respiration or ask your own question. Can a small polypeptide fold over itself and have a tertiary structure?